← Poetic homage to Autumn: authors known and unknown…. The essence of this important new book is summed up in its subtitle: ‘understanding the ancient discipline in the contemporary world’. I found it a highly stimulating read which has come my way at an ideal time. Having just returned to the practice of astrology this year after a very long sabbatical, I have found “Integral Astrology” very helpful in ordering my own thinking about what my relationship now is with our ancient art in this turbulent, challenging time. We stand not only at the start of a new Millennium, but at a liminal point. The dominant paradigm of rational materialism which has determined our world view since the Age of Reason in the 17th/18th Centuries with such success, is creaking and groaning. Post-modern perspectives on the age-old understanding of ‘As above, so below’ are slowly making their way towards the forefront of contemporary consciousness and culture – bringing new insights from physics, humanistic and transpersonal psychologies, chaos theory etc. They all challenge the materialist view that physical reality ie matter, is the real reality….The strength of Armand Diaz’ book lies in the clear way he weaves together the insights which astrology can and does offer to both individual and collective life, with just those post-modern insights. Armand Diaz, with good reason, is worried that astrology, despite its own flowering and moving closer to mainstream culture since its revival from the 1960s onwards, is going to be left out of this shift: running a parallel course with the New Paradigm disciplines, but at a considerable distance from them. His fear is that if we do not re-examine and re-frame our own discipline in the light of contemporary perspectives, not only will astrology be left on the outside of the larger New Paradigm world view, but astrologers will too. Diaz’ core point, which he emphasises in different ways throughout, is that the level of consciousness at which an individual is operating critically determines the way in which astrological symbolism plays out. Had I been an astrologer in Chaldean times, for example, I would not have been able to ponder today’s transiting Mars square my natal Mercury (7.9.12). Astrology then was about the king and the kingdom; no individual horoscopes existed. A century ago, sibling conflict might have been predicted. In today’s post-modern consciousness, I am choosing to channel intellectual energy into hand-writing this book review….in between brisk “thinking” walks! Diaz also briefly and clearly surveys the different astrologies there are which co-exist in our contemporary world – where it is perfectly possible to practice mediaeval astrology, post-modern psychological astrology, AND archetypal cosmology which sets our ancient art clearly in a New Paradigm context, and call them all “astrology.” As Diaz makes it clear, there is no one astrology. Put very briefly, the models he lays out, centering on Spiral Dynamics, provide a way of thinking about the evolution of human consciousness which links individual, group and collective processes. His key point is that these models provide a ‘vertical framework’ for describing the upward movement of consciousness from Matter > Life > Mind > Soul > Spirit: the core process behind the Perennial Philosophy which underlies all the differing consciousness models eg Koshas, Chakras, Yoga, Kabbalah right through to post-modern Spiral Dynamics. He points out that astrology can indicate the timings and types of stresses and challenges encountered by individuals. But it cannot say whether those challenges will lead to evolution of consciousness up the ‘vertical’ scale. To assess this needs the dynamic of astrologer, horoscope and client, usually over several encounters rather than one. 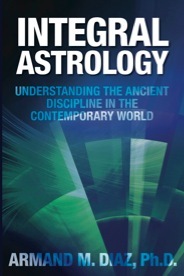 In his final chapter “ Consulting”, Diaz presents a model of astrological practice which, with examples from actual client work, lets one see how the weave of contemporary perspectives from both the sciences and the humanities which he has laid out in this book, all come together in the consulting room. It is challenging, impressive – and helpful in a down-to-earth way. I would recommend this book to astrologers at all levels of learning their craft. It introduces newcomers to a model which places astrology in the context of New Paradigm perspectives, which they can take forward with confidence as part of the world-changing shift re-claiming that ancient insight ‘As above, so below’ for a level of collective consciousness appropriate for the vastly more complex Universe we now know we inhabit. And it gives a good shake-down to the practice of more seasoned astrologers such as myself – who may be in danger of becoming set in our ways…..
“Integral Astrology” by Armand Diaz, Ph.D, published 2012 by Integral Transformation, LLC. pp 192. This entry was posted in 04 - New Posts: October 2012 onwards, Astrology Article Archive 1 – "Not the Astrology Column", Book Reviews and tagged astrology, Divination, Perennial Philosophy, philosophy, Philosophy of Mind, Religion and Spirituality, Saturn, Spiral Dynamics. Bookmark the permalink.